We already took a look at the Razer Blackwidow Ultimate earlier this year, and this new “Chroma” version is 95 percent the same—with the addition of fancy new RGB backlighting and another $40 tacked onto the price. 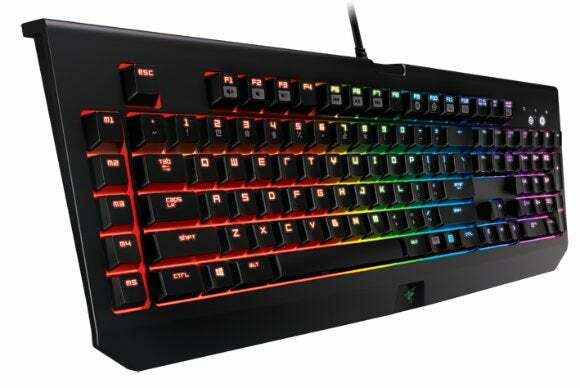 Like its predecessor, the Chroma is a sleek and durable black keyboard designed specifically for gaming. This is most obvious in its custom-designed Razer Green switches, which (as far as I’m aware) are branded Kailh switches. Razer Greens feature the same tactile click and actuation force (50cN) as Cherry MX Blues, but the actuation point is a bit higher. Cherry MX Blues are traditionally considered good for typing, because you can learn to press keys without bottoming out—striking the key so hard it slams into the bottom of the board, putting strain on your wrists and fingers. However, the low actuation point can be problematic in games because it’s harder to double-tap keys. 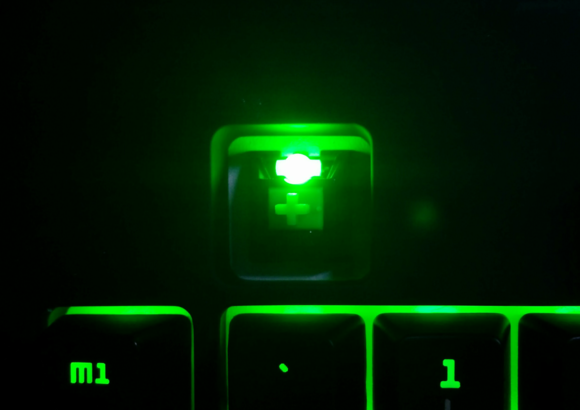 Because of this, Razer’s Green switches move the actuation point closer to the key’s resting point. This makes it easy to double-tap keys, which is good for games. The side effect, however, is that Razer Greens are not very pleasant to type on. With their heavy up-front resistance and high actuation point it’s easy to bottom out keys, and they’re just not as “fun” to type on as Blues. It’s kind of up to you to decide what you think you’ll be using your keyboard for more—typing or gaming. If the latter, Razer’s Blackwidow line might not be a bad choice. These keys combine some of the benefits of MX Blues and Blacks, producing that nice mechanical clickiness while still being good for games. As someone who types a lot though, I still think Razer’s switches are a pain to use. I literally cannot type on this thing without bottoming out two-thirds of my strokes, even when I’m concentrating on it. That’s all the same as the previous model though, so let’s cut to the new stuff: The RGB backlighting. I actually liked the backlighting on the basic Blackwidow Ultimate model, despite the trademark Razer eye-searing green color scheme. The Chroma’s really the Razer product I’ve been looking for though—finally, a device of theirs that I can customize to look the way I want. The Chroma’s backlighting is gorgeous, no matter which color you choose. Keys are evenly lit,and there’s not a ton of light leakage around the edges of the keys—certainly less than Corsair’s K70. I’m actually fascinated by Razer’s design, because it’s something I was told couldn’t be done by both Logitech and Corsair. Prying off one of the Chroma’s keycaps reveals that the standard Cherry MX stem design stayed intact here—unlike Logitech’s Romer-G switches—but Razer’s also managed to put in full 16.8-million-color RGB lighting without using all sorts of crazy clear-plastic refractive bits and utilizing tons of light leakage, like Corsair did. Instead, there’s just a single lens embedded in opaque black plastic. It’s honestly the RGB design I’d like to see all manufacturers adopt, except for the Razer Green switches. The only place where Razer screwed up is in the Caps Lock/Num Lock/Game Mode/et cetera pane in the top right. In the last model, I complained that by embedding icons under plastic instead of using simple light indicators, Razer made it harder to tell what was active and what wasn’t—everything was blurry. That problem still exists, with the added fact that those lights aren’t RGB-enabled. Instead, they always stay an unattractive off-white. It’s an otherwise ugly misstep on a beautiful keyboard. Other manufacturers could also learn a thing or two about software from Razer. Especially Corsair. 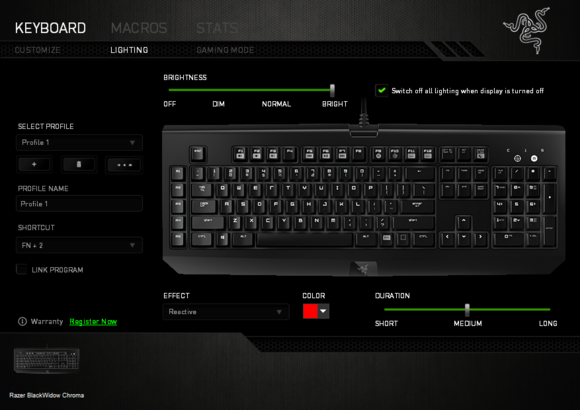 Razer’s Synapse 2.0 software is a somewhat weighty utility, which is its main flaw. 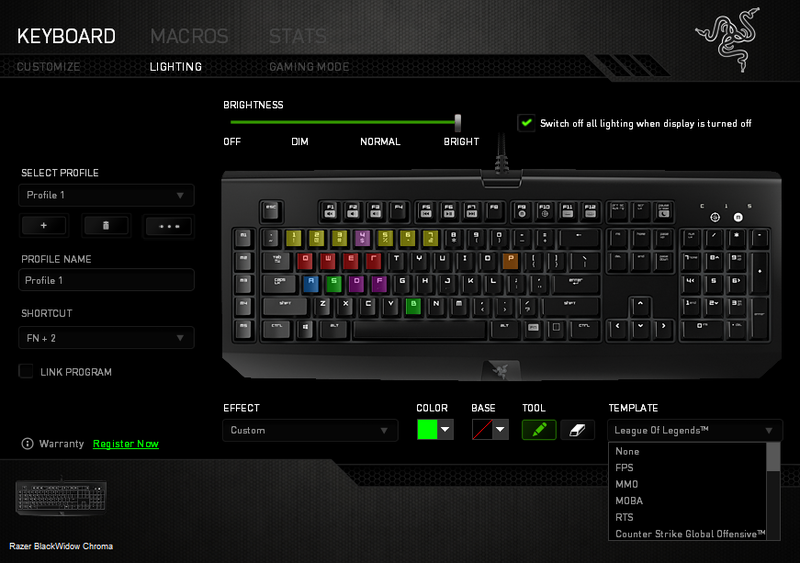 However, the process of setting up the Chroma with all manner of pretty colors couldn’t be more intuitive. 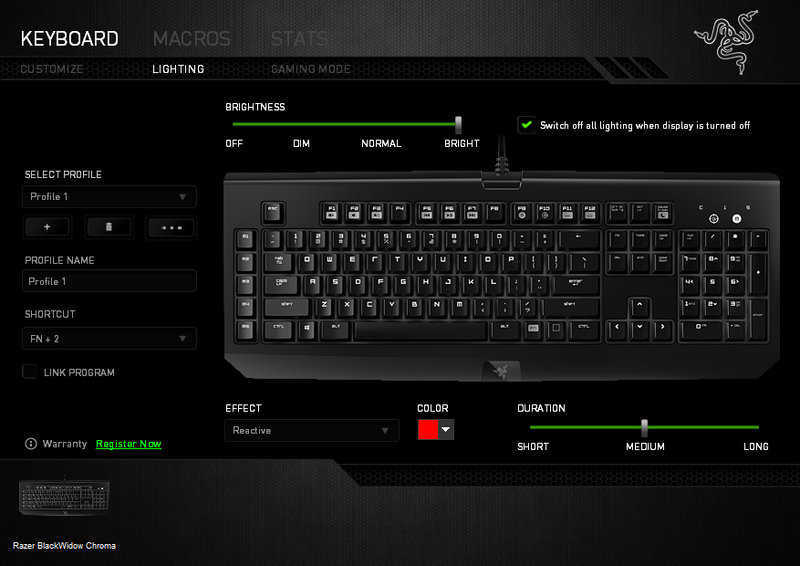 I plugged in the device, Synapse recognized it and immediately brought up the Chroma configuration screen. From here I could make a new profile or edit the default. Out of the box, the Chroma is programmed to cycle the entire color spectrum. New profiles are automatically programmed to Fn plus a number key. You can easily swap on the fly from your default profile to your FPS profile and back again without ever re-opening Synapse. Lighting is all handled on one panel, and changes occur automatically as you edit. You can adjust the brightness here (though you can also still do that from the keyboard itself). There are five lighting presets: Breathing, Spectrum Cycling, Wave, Static, and Reactive (keys light up as you touch them). There’s also “Custom,” which allows you to change keys individually. Alternatively, you can start with a template that highlights keys typically important in different game genres. 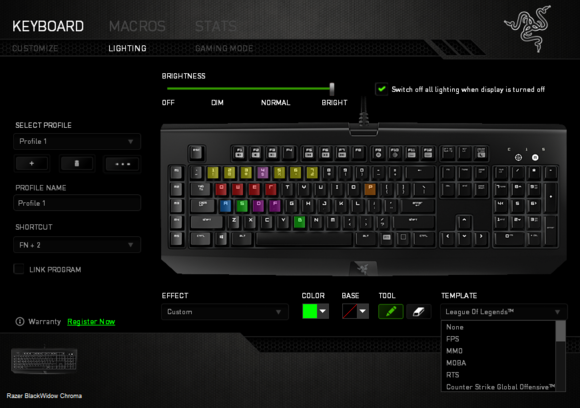 The first-person shooter template, for example, lights the WASD keys red, the R key green, and the 1-5 keys in yellow. Everything else is dark. There are also templates for MMOs, MOBAs, RTS games, and even specific branded setups for League of Legends, Dota 2, Counter-Strike: GO and StarCraft II. It lacks the wealth of options available for both Logitech’s G910 Orion Spark and Corsair’s K70/K90, but on the other hand it’s dead simple. Seriously, you can get up and running with an attractive color scheme on this thing in less than two minutes, it’s entirely intuitive, and then you can swap between all your profiles on the fly without ever having to look at Razer’s software again. This is the type of approach other manufacturers really have to take a look at. Sure, I’d love if Razer implemented some of the more advanced options from other keyboards—timed color changes to indicate skill cooldowns, or custom wave patterns—but those come secondary to the average person's being able to use the damn thing. I still don’t like typing on the Blackwidow’s Razer Greens any more than I did the first time around, but if you’re primarily buying this for gaming that probably won’t matter to you anyway. And for the record, I do like Razer Greens more than I like Logitech’s Romer-G switches. A lot more. As far as the RGB front, the Chroma is a simplistic beauty. The Chroma’s lighting setups are neither as intensive nor as customizable as the Orion Spark's or the K70/K90's, but Razer understands one thing extremely well: It’s better to cater to the masses first, and then add more functionality later. I hope to see Razer do more with its lighting through later Synapse patches, but at the very least you’ll be able to plug in this thing and make it look good immediately. That deserves praise in itself.